What exactly is the Newick format? Remember back in second year CS when your data structures / abstract data types / algorithms instructor said you can represent any tree as a traversal? Well, if not — don’t fret, it’s not hard to get the hang of. A traversal is a finite, deterministic representation of a tree which can be thought of as a road map of how to visit each node of the tree exactly once. The phylogeny / bioinformatics people will know each of these nodes as either taxa / sequences (the leaves) or profiles (the internal nodes — i.e. not the leaves). A tree in Newick format is exactly that — a traversal. More specifically, it is a depth-first post-order traversal. When traversing a tree, we have a few options about how we want to visit the nodes — depth-first post-order means we want to start at the left-most, deepest leaf, and recursively visit all of the nodes before we end at the root. A tree expressed in Newick format describes a tree as an observer has seen it having visited each node in a depth-first post-order traversal. This is where it gets tricky and recursive — the “node” item above can be another node, or a leaf — when a node is composed of at least another node, we call that a recursive case; when a node is composed of only leaves, we call that a base case. We make this clearer in the next section. The semi-colon at the end means that we have finished describing the tree. There is no branch length as the root of the tree is not connected to a parent. Base case e.g. : The below node is composed of two leaves. Recursive case e.g. : The below node is composed of a leaf on the left, and another node on the right; this right-node is composed of two leaves. If the names look a bit funny, that’s because these are sequences pulled out of a blastp search. 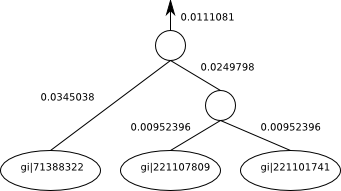 The Newick tree itself may have any number of nodes, the base case being a single node. The only restriction is that any node either is a leaf (has zero children) or must have two children (never a single child). These two children again are allowed to be either leaves or other nodes. Where the numbers beside the edges are edge length and the names of the named taxa are indicated inside the circles (leaves). The unnamed internal nodes are the profiles that have been calculated with alignments. You’ll notice that there’s a branch length leading out of the root of this subtree into the rest of the tree (not shown). If this was a complete tree on its own, the root would have no branch length there and no arrow coming out of it. Now that we have reviewed the depth-first post-order traversal, the Newick format and how to interpret it; we can move onto parsing these things. In parsing, we hope to create an in-memory structure that represents the tree. The parser I discuss assumes that the Newick format string already has had all newlines stripped, as it uses regular expressions. If your trees aren’t stored that way, just make sure that newlines are stripped before feeding it into my function. The in-memory object that’s created will have the following fields as a minimum. I also use the following two fields to keep track of a few house keeping items and to make life pleasant for future tasks with this in-memory structure. Note that in future, a depth-first post-order traversal will yield the nodes in the exact order that they were read — so in reality “this.serial” isn’t really needed, but it’s nice to have for future functions you might write as a shorthand. Have you understood why these nodes would occur in the same order? Here’s pseudo-code for the recursive descent parsing function “tree_builder(<newick_string>)” — I don’t indicate where to strip away newlines because I assume they’re gone. I also don’t indicate where to strip away whitespace (I did previously, but that took up like half the pseudocode). So if there’s a place where you suspect whitespace can occur, strip it away and increment the cursor by the length of that whitespace. Note: We are assuming that there are no newlines in the file — that is, the entire newick traversal is one string on a single long unbroken line. //     to allow it to use the 'this' keyword. //     you may need to explicitly create a new object instead of using 'this'. $cursor ++; // move cursor to position after "(". 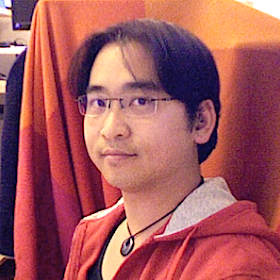 $this.left = new tree_builder(newick_string); // RECURSIVE CALL. // move cursor to position after matched name. // notice: if no $name found, just skip to finding branch length. $cursor ++; // move cursor to position after the colon. // move cursor after FPV. $this.right = new tree_builder($newick_string); // RECURSIVE CALL. // again, accept if no $name found and move onto branch length. $cursor ++; // moving past the colon. $cursor ++; // move past ")". Finally, there is a traversal function, and an expose function. The traversal function returns the node objects in an array following in the natural depth-first post-order described previously. The expose function is a debugging function which writes the output using “thoughts_write(<message>)” which wraps “document.write(<message>)”. You can change “thoughts_write(<message>)” to print output elsewhere using “document.getElementById(<some_identity>).innerHTML += (<message>)” where “some_identity” is the “id” of some element in your HTML. Without going into detail, the traversal function also uses an internal “ref” object which refers to the array as it is filled. In putting this thing together, I managed to relearn JS, recursive descent parsing and making JS pass things by reference up and down a recursive stack of function calls. Andre Masella helpfully reminded me that I didn’t need to use any kind of BNF or LALR(1) parser — just an easy single-function parser would do. This is actually a port of a C# parser which does the same thing that I wrote in an earlier step for phylogenetic analysis — the difference being that C# offers a “ref” keyword that allows one to specify arguments in a function’s parameter list as emulated references (functionally equivalent to using C’s asterisk and ampersand convention though not operationally equivalent). Happy parsing! The code presented should be easy enough to understand for you to port it into the language of your choice for whatever purposes you design. Add an arbitrary Mediawiki search box anywhere! Update: A better solution that doesn’t require a separate “search-redirect.php” file has been posted here. I’ve been looking for this solution for a long time now and I’m happy to have finally found it. Following hints from Dave Taylor and Peter De Decker, I’ve glued together a solution that doesn’t take too much effort and doesn’t require any additional hacking around in SQL. It might be a bit different for your installation depending on the version that you installed and a few of your settings– to find out what it looks like, search for something and copy down the URL in the address bar. The file “search-redirect.php” used by Wikipedia takes in your search terms, and mangles those terms into a URL conforming to the above example. It then redirects you to that constructed URL. You can find this used on the main page of Wikipedia as noted by Dave. Putting this code on a page with your own wiki URL as a stem instead of mine will allow you to search your own wiki from any other page.